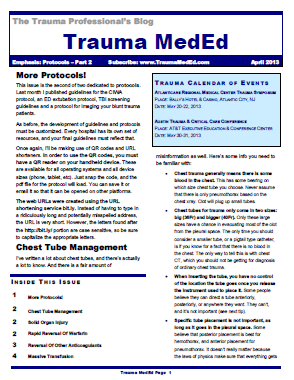 The May Trauma MedEd Newsletter Is Available! The April newsletter is now available! Click the image below or the link at the bottom to download. This month’s topic is TBI. Is the GCS scale getting too old? 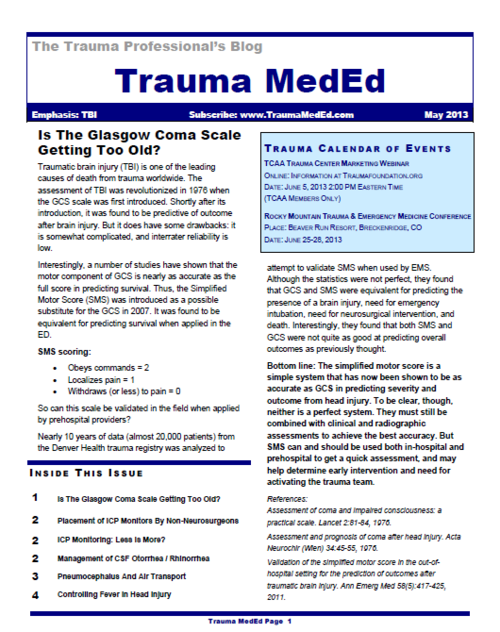 New Trauma MedEd Newsletter Released Tonight To Subscribers! The May issue of Trauma MedEd is ready to go! Subscribers will receive it overnight tonight. This issue is devoted to Traumatic Brain Injury. An alternative to the GCS? As mentioned above, subscribers will get the issue delivered tonight to their preferred email address. It will be available to everybody else on next Wednesday’s blog post. Check out back issues, and subscribe now! Get it first by clicking here! The April newsletter is now available! Click the image below or the link at the bottom to download. This month’s topic is Protocols (again). You’ll need a QR code reader if you want to download to your mobile device. Or just use the web URLs provided to download to your desktop/notebook. Next Trauma MedEd Newsletter Available Tomorrow! 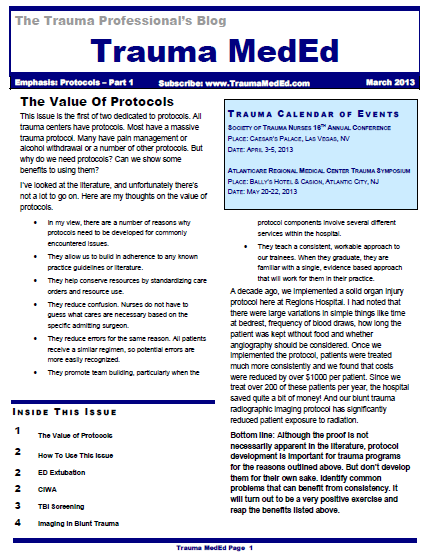 The April issue of Trauma MedEd was sent out to subscribers over the weekend. This issue, like the March issue, is devoted to protocols. Be sure to have a good QR code reader for easy retrieval. Otherwise, warm up your fingers so you can enter URLs to download the protocols. This issue will be available on the blog tomorrow!